You’re a natural health & wellness business owner with an existing business and you’re ready to get serious and take things to the next level. You want to expand your services online, possibly create and sell digital or physical products, perhaps even create a membership site. You’ve come to the right place. There are a bunch of ways we can work together. Your current website design is looking dated or your business has outgrown your current website. I can analyse your current website and business and give recommendations on how best to approach the website redesign. Sometimes a complete redesign isn’t the best approach. Instead, we can make incremental changes to your existing website. In both cases design decisions will be supported by data or best practice guidelines. You’re ready to create your own online course to bring in more passive income. Creating an online course can be quite time-consuming to create and the technical side can be overwhelming. Focus on what you do best and let me take care of the design and tech. I can also help you with your launch and general marketing strategy. Would you expand your website so you can sell digital products or physical goods? I can help you get e-commerce ready using either WooCommerce + WordPress or the Shopify platform. A digital product or online course needs a well-designed and well-written sales page to optimize it for sales. I can also help you set up a funnel (or funnels) in addition to the sales page. I’ve been Gabriella’s client since spring of 2017. I was desperate for some very customized web applications for my business. I needed more organization and direction. In short, my web presence was one hot mess. Since then, Gabriella has rebuilt my website, organized my web presence, moved me from eventbrite to my own online store, created an online student portal for student access, automated my certification process, created an online directory for my students, driven my facebook advertising, helped me rewrite my web copy, set up email automation, created custom documents for my business, met me and my team personally in St. Marteen and given me amazing marketing advice. Gabriella is, not only efficient, proficient and timely, she is intuitive, artistic and compassionate. I didn’t know I needed all that in my web genius, but I did. So do you. Stop thinking so hard about getting help. Gabriella is a brilliant bright light. She has helped me grow myself and my business in ways I never imagined. She will help you, guide you and be your friend in all ways.I don’t know what I would have done without her. We absolutely love our new website! The response from our customers have been overwhelming and all positive. Before our new website, we had a limited audience around the age bracket of 50 – 65 age group. Our new website has opened doors to a much wider age bracket. Our sales have dramatically increased with the user friendly and easy to navigate website. The website has made our life much easier by reducing the amount of work we had before. Gabriella has been reliable in all forms of communications in finding options and solutions very quickly. Her multi-skills makes a good combination of artistic flair and marketing strategies. Before starting any kind of project we need to discuss your strategy, your requirements, timeline, budget and more. Perhaps you need feedback on your idea or you need someone to suggest a clearer path on how you achieve your goal. If you haven’t done the exploratory work needed before embarking on a big project then I recommend my super valuable and highly strategic 1-hour phone call. It’s US$150 and if you proceed with the project the price gets deducted off the total project cost. 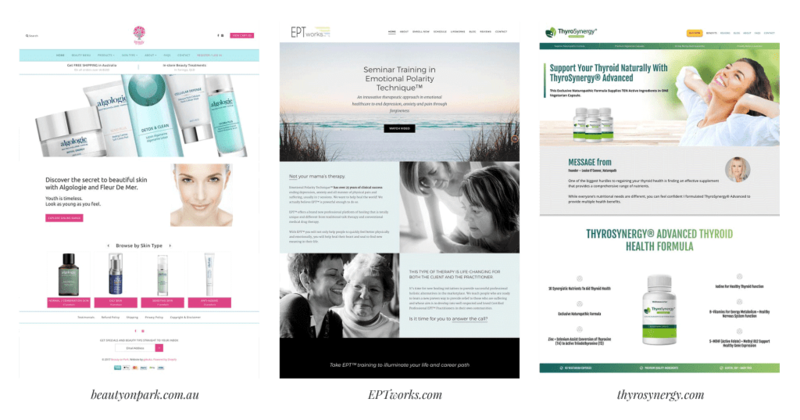 These custom projects work best if you can write really well or are willing to hire a professional copywriter for general messaging and sales pages. Investing in professional photography can really help you build your unique brand. I can recommend copywriters and photographers, if needed. I only take on a limited number of projects so that I can give all my focus and energy to the project at hand. Most of my clients continue to stay with me and in a way I’ve become a business partner that helps them grow their business year after year. Let’s talk and see how we can work together and if we’re a good fit.